You’re 9 years old. You’re at Thanksgiving dinner at Aunt Louellen’s house. After hours of waiting and making minimal noise at the kids’ table, it’s finally time to EAT PIE. Your one allotted slice of apple covered in vanilla ice cream is gone in 3 minutes. You look longingly over to the dessert table. No one else is around except for Uncle Bob. You wink at him conspiratorially as you reach for a second slice. He’s cool. He knows what’s up. That’s right. Uncle Bob was a snitch. He was then and he is now, and even though the years have passed, you’ve never forgotten it. You’ve been waiting years to obliterate Uncle Bob for this betrayal. It’s time to exact your revenge. It’s time for a family-wide Mad Verse City tournament. 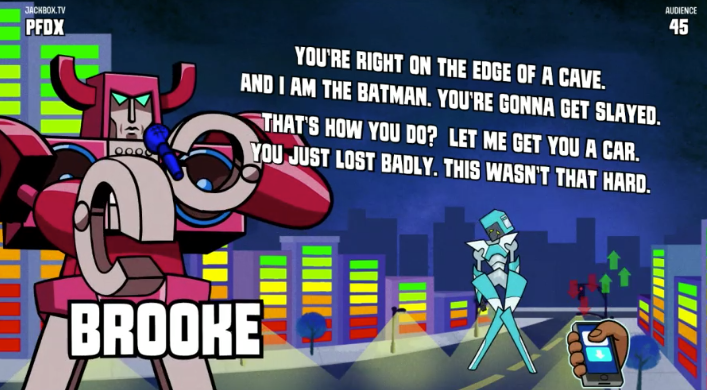 In Mad Verse City (one of five games in The Jackbox Party Pack 5), players craft rhymes for robots to perform in a text-to-speech rap battle. Each round involves a player receiving a prompt for a single word (example: “an occupation”) and the game uses it to create your first line. Then, you write the second line on your own, making it rhyme with the first. This repeats twice and ta-da! You have a verse. Once you’re done writing, you’re pitted against an opponent. The robots read out your creations and the audience votes on a winner. Watch us play the game here. A round with eight players lasts about 30 minutes. Just enough time to digest between the main dinner and dessert. You can play Mad Verse City (and the other four games in The Jackbox Party Pack 5) on major digital platforms now!